Intro from Jay Allison: Snap Judgment is all about the music, the beat. For Pat Mesiti-Miller, both the words and the music are "malleable." They can be manipulated to play well together. He shows you how. After you read and listen to this, check out the rest of our Transom Series, "Using Music." Music in storytelling has a lot of different functions. It has its place to enhance emotion, creating auditory images can help explain concepts, and a good beat can help move the listener through the story. Working on Snap Judgment, our musical selection is a big part of what makes our show go. We create a pulse and pace to the show that pulls the listener into our stories. Selecting the right music can be tricky and time consuming. It’s easy to get sucked into an afternoon listening spree searching for a song that when dropped under your dialog creates one of those magical musical moments. The following are some ways I’ve found to make those moments happen more often. The first thing I do when I’m approaching a score is separate the scenes. I don’t set strict time limits on how long or short a piece of music can be played, but I do follow one rule: a new scene needs a new sound. Between each completed thought I insert a few seconds of silence for reference. These gaps offer opportunities for musical changes and punctuation. By isolating a story’s events and concepts into different musical passages, we give the listener the story’s information in chunks. Each chunk is packaged within the music; each makes for tasty echoic digestion. If your musical phrasing is clear and calculated, the subject’s thoughts will feel the same. Once I get my chunks spread out, I push and pull, adapting the vocal to fit the musical form, and the form to fit the vocal. One of the great freedoms in postproduction is that we have control over the timing of both the dialog and the score. I try to keep the natural rhythm of the person speaking, but there is always wiggle room. Often I will stretch out pauses or shorten gaps between phrases and words to get the tape to fit right on beat, or to complete a sentence within a musical idea I’ve inserted. Instead of thinking about placing music around existing tape, I like to think of dropping dialog into the score. J Dilla Intro being edited in Logic Pro 9. Here I placed my vocal (PAT) to come in on beat with the music. I also cut Jeff’s laugh and “yeah” sound byte at the end to land in time. Hear how his laugh comes in with the snare? Ha-ha! After he says “yeeeahh,” I am finished with the opening scene; there’s our music change. Also note how the new music comes in on beat. The dialog for a story is malleable, and so is the music. I like to rearrange, chop, pitch, loop, and manipulate nearly every piece of music I use. So, when selecting tracks, I often search for songs that begin simply and gradually build over time. I like music that introduces a new instrument every few measures so I can loop phrases I like and build the song as the story develops. I don’t approach the recordings as continuous songs that can only be played from beginning to end. I see phrases, moments, pieces that can fit together in ways to better serve the story. Here is an example from a story with the host of Snap Judgment, Glynn Washington. In this story, a young Glynn wants to play the cello but his school’s music teacher is wary of him. 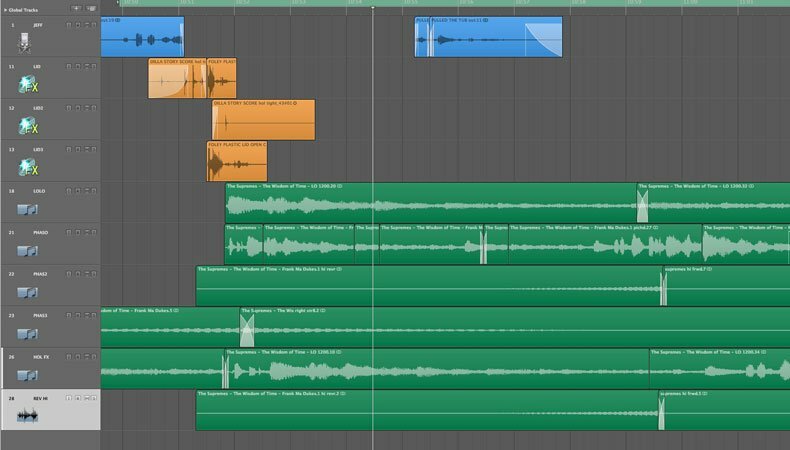 Cello Intro being edited in Logic Pro 9. The original song is on the track titled “ORIGINAL,” the different sections are colored to match how they appear in the score. Here you can hear where I pulled the different phrases. Just as rhythmic phrasing is malleable, so are pitch and timbre. Here is another example from the J Dilla story using a song by The Supremes, “The Wisdom of Time.” All of the music in this scene comes from a small loop in the source material. Pop Lid being edited in Logic Pro 9. Note: The screenshot doesn’t show regions as they were looped, rather bounces of the manipulated audio. Here I did a whole bunch of manipulation to the audio. I pitched, looped, phased, delayed, the list goes on. I wanted to provide a screenshot and the source material to illustrate how many different sounds you can get from just a small source. See if you recognize the elements in the score and imagine how I got them to sound the way they do. For me, the most important practice is to listen, listen, listen. Find your favorite pieces and dissect them, pick apart their sound qualities and try to understand what exactly is going on. Identify what you like about a piece; emulate that. Identify what you don’t like, avoid that. We all learn from each other. Experiment! Be bold! Make mistakes! Keep your ears and mind open, the possibilities are endless. 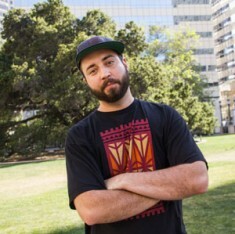 Pat Mesiti-Miller is a producer and sound designer for NPR’s Snap Judgment, he is also a music producer and artist. Learn more at www.patmesiti-miller.com; and follow him on Twitter @patmessy. Nicely chosen examples. That attention to detail creates a piece which stands up to repeat listening. Pat, you are absolutely killing it. I’ve started using sound to add flavor to Excel tutorials, and Snap Judgement is an inspiration. I really like the tips you offer here. I hadn’t thought of putting the spoken words in beat with the music. I’m going to start using that technique.